Thanks to the love of his handler, the generosity of animal lovers, and the skill of veterinary surgeons at CSU’s Veterinary Teaching Hospital, a retired bomb-sniffing dog named Kay is on the mend despite what was called an “inoperable” tumor on his heart. Kay, a 9-year-old pit bull and Labrador mix, served two tours in Iraq hunting down improvised explosive devices. Then U.S. Army Spec. Brandon Donahue became the war dog’s handler and grew devoted to Kay during three years of grueling bomb-detection work in Kandahar, Afghanistan. Donahue adopted Kay in May 2013, after the soldier and dog finished their final tour of duty. Donahue and his wife, Brandi, wanted to give back to Kay after he had given them and others so much. 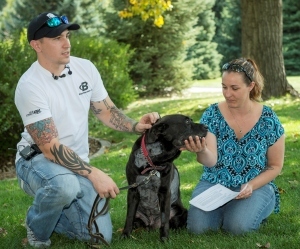 They hoped to provide the retired war dog with a relaxed life at their home in Brighton, Colo. But the Donahues learned that Kay has an inoperable heart tumor, a condition that some veterinarians told them would require euthanasia. The Donahues were undaunted in their desire to help Kay – and they found the help they sought with canine heart specialists and surgeons at CSU. Read the rest of this heartwarming story here. I’m especially moved by this because my beloved Gracie is also a black pit bull/Labrador mix. Good dog, Kay!